Tales from the Real OC (Really! ): Eternal Flame!! Journey to the beginning of forever as Damen meets his soulmate for the first time. "She is the single embodiment of everything I've been searching for . . . my destiny . . . my reason for being." Ready to read ETERNAL FLAME, a short story told from Damen's point of view? thank you for this story Alyson!!! I dont understand this i thought there was only going to be six books you never mentioned this eternal flame?? Thanks, Jenna- hope you enjoy it! Bae- There are only 6 books. Eternal Flame is just a short story I wrote for the readers who subscribe to the Immortals web site. Alyson, a shor-story about Damen? Only you to have wonderful ideas like that. Im a writter. Im just a beginner but i think i can do more more than simple words. You're really one of the best writters to me. Have a good day. Just finished reading it...absolutely amazing! Thank you very much for letting us inside Damen's mind. Thank you so much, Vitor--I wish you all the best with your writing! Thanks, Nelly--so glad you enjoyed it! it was really good. are you gonna keep adding more onto it or do other immortals?? HI Anonymous- Thanks! I may add to the story for the Night Star release since I had so much fun writing it--and yes, there will be 2 more Immortals books following DARK FLAME! NIGHT STAR will be in stores on 06.22.10--and the 6th & final book on 11.16.10! Hey Anonymous- Oh, I misunderstood! The answer is, I'm not sure--if I have time to do more, I would love to, but the books under deadline have to come first! Thanks so much, Tara-it was so fun to write- I'm thrilled you enjoyed it! When does Night Star come out??? Hi Anonymous- NIGHT STAR will be in stores on 11.16.10! alyson I really enjoyed this little short story and do hope you add onto it as the books finish up! so night star comes out 11.16.10, what about the sixth and final book? Hey Heidibug- Thanks! As for the 6th & final book, I don't have a release date yet, I still need to write it (! ), but I'm guessing it'll be out sometime in mid 2011? Eternal Flame is awesome!!!!! u r one awesome writer. i really hope u add on to it, it would be good to know his side and how he lived. i just finished Dark Flame and omg the ending is just OMG! love you! Adrianasntlln- Thank you--you made my day! If I have time, I hope to add on to Eternal Flame since it was so fun to write! First of all, I want to say that it is really amazingly (for lack of a better word) awesome of you to actually respond to the people that post on your blog. I have so much respect for you, Alyson, for doing that! Second, I have officially jumped on the Immortals bandwagon! I love reading, and will read pretty much anything out there. I'd heard of the Evermore book, and thought I'd give it a try. I loved it! Read it in a day, I couldn't put it down! Because of that, I cannot wait to start rading the rest of the series, going out today to buy the others. Dear Alison, I hooked up with your storyline 'cause my friend offered me the first book and I was intrigued what Damen is lol i'm so used of vampires's storyline but no, you made it in good way and I loved it and I love Riley, I missed her on the second book I hope Ever will be able to see her one day :')In france we just got the third and i'm starting to read it ! I love your storyline but It's so heartbreaking what happened to Damen and Ever :( you reminded me a couple who couldn't touch on the tv show "Dark Angel" I hope they'll be able to be together and for the eternity ! Just finished reading Eternal Flame, LOVED it!!!!! I can't believe it's only a short. I can only imagine how amazing it would as a full novel. Hi Anonymous-Thanks so much! I'm so glad you enjoyed it! 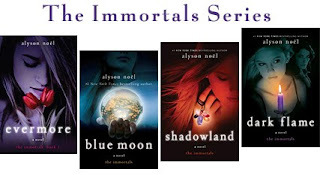 "the immortals" series is one of my favorite reads to-date. ms. noel, you did a really good job with this. thanks for creating such a wonderful story, and i'm hoping to have my own copies of the books as soon as i can. piijae santos - Thank you so much--that means a lot to me and I'm thrilled your're enjoying the books! As far as writing tips go, I just added a special section on my website for aspiring authors here: http://www.alysonnoel.com/singles/faq.php. Hope this helps! Wishing you the best of luck! i havent read this just yet, but i can tell that by reading your other books, this one too is going to be fantastic! I too am studying to be a writer and being so influenced by your books, i was just wondering, where do you get all your ideas from? because whenever i try to write something, i always try to change it in some way, because i dont think its good enough, any advice? Anonymous - Thanks so much! Most of my stories are influenced by my own life experiences. I just recently added a section to my website for aspiring authors at http://www.alysonnoel.com/immortals/faq.php. Hope this helps! Wishing you the best of luck with your writing!